I do photo etching. I take other peoples' drawings and my own and convert them into small metal pins, pendants, plaques, or whatever. There are lots of variables, but generally somebody sends me a drawing and I do all the necessary photo and metal work to convert it into something they want. 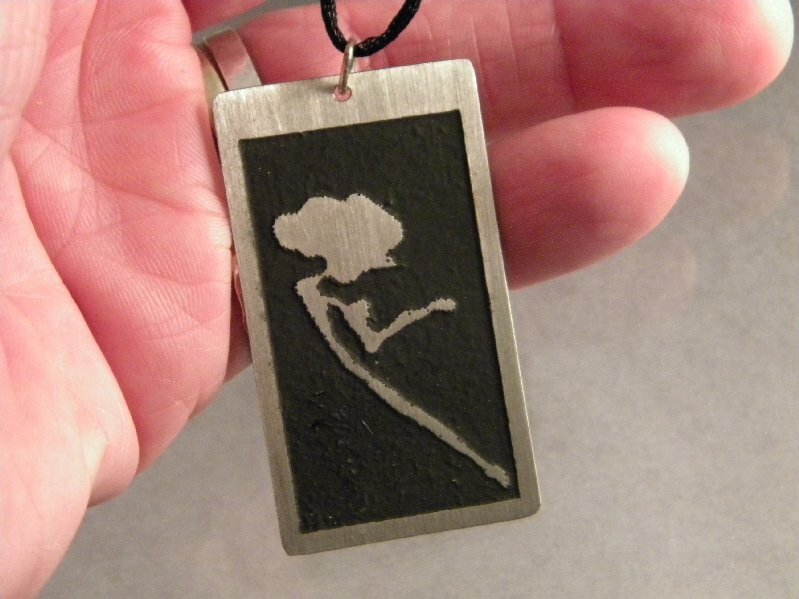 It makes a nice gift and I have done work for other artists so they can sell jewelry based upon their own imagery. Generally the whole process, with shipping, come to $35.00 for the first piece and $15.00 for the second piece, if you need more, we can talk. Being an art teacher, I've taken quite a few student drawings and made them/photo-etched them into various objects. The drawing above was done by my niece Rachel when she was in junior hi that is a little over 12 inches tall. This is a close up of the pin I made from Rachel's drawing. Nice, wearable, pin. The drawing above was done by a a two year old that her mom sent me. I think she took the picture with a cellphone. I prefer a little better image, but the reason I'm posting this is because it shows what can be done. Being based upon the child's drawing, it's a great gift for a family member. 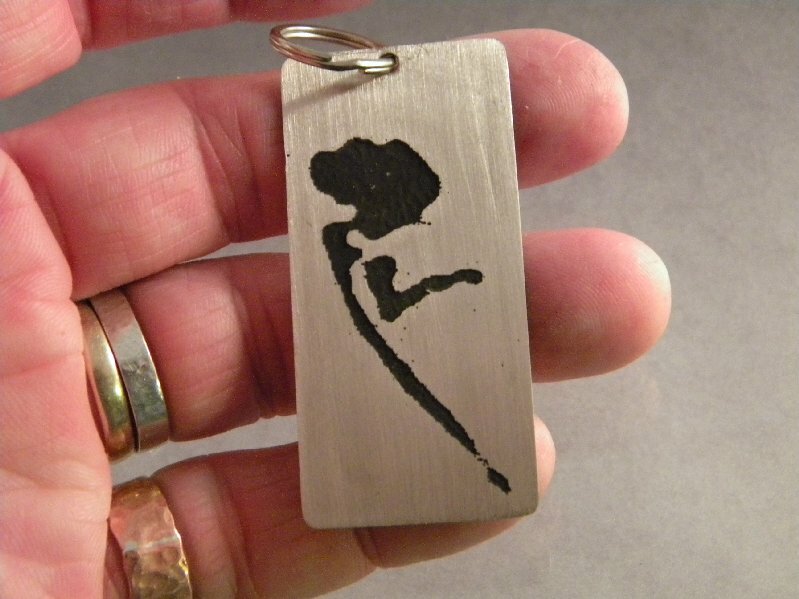 This one is for hanging on a key chain, but it could also be strung for a necklace. They get pretty scratched up hanging on a key chain, but still retain the image and have a nice, well-worn look after a while. Stone cost is hard to estimate until I know the size and the type of stone desired. 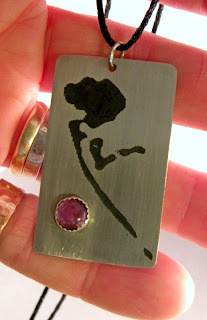 The one above is an inexpensive amethyst I had in stock, so it only added $20.00 to the cost. Here I reversed the image and etched the back ground to give it a little different look. I sometimes do this if I think it will work better aesthetically, judgement call, really. 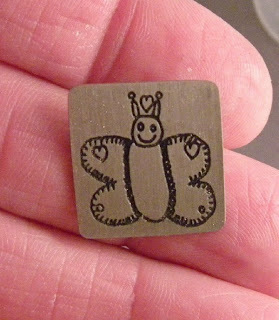 This is another young child's drawn image I photo etched into metal. Great looking butterfly, and a great gift for her grandma, as I recall. 1. 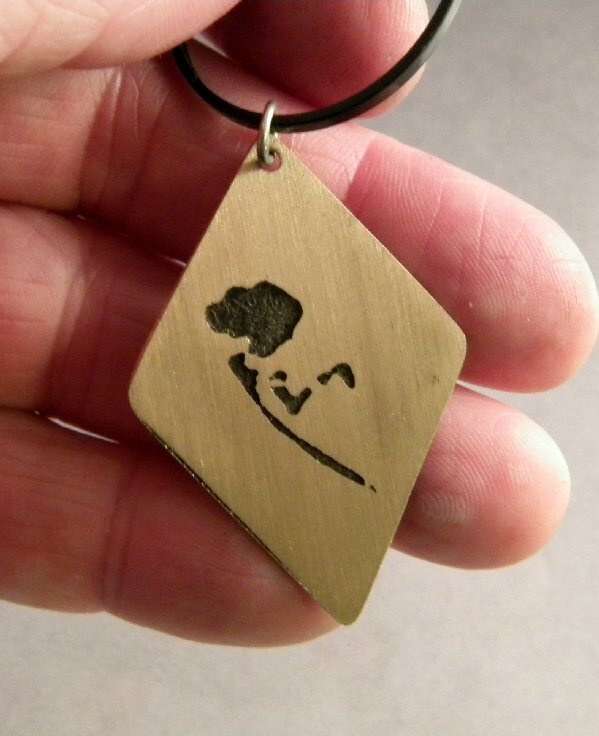 You send me an image and give me an approximate size and idea as to what you want; pin, pendant, etc. The best way is to actually send me the actual drawing, smaller is generally better than bigger. If you have a certain size you'd like for the image, shrink or enlarge it to the size you want and then send it. Or just snap a picture or scan it. 2. I get the image and we e-mail once or twice as to any details that you are concerned about. 3. You pay me $35.00 for the first one by clicking the Pay-pal button. This includes all the necessary work and shipping for one etched item. I put them in a nice cloth gift bag. You should not have to wrap it, unless you just like that sort of thing. 4. I generally get it done within a week or so. I say or "so" because it's usually more cost effective and you sometimes get an extra one if I'm doing other etched work at the same time. If it's a rush job, you need to e-mail me and I can say yes or no as to weather I can complete it in the required time. It does not cost anymore for this, just let me know. Thanks for reading and shopping!